How do you determine what version of Android your Phone or Tablet is running? Having worked with a few Android devices running different Android versions, it has become obvious to me that it’s not always as obvious how to determine the exact Android version your device is running. Unfortunately, for some of our guides you might need to know what version your device is running, as certain methods rely on particular versions. So in this article I’ll guide you through a few methods on how to determine what Android version you’re looking at. Below 5 possibile ways to determine the Android version of you Android device – of which option 4 and 5 are really a last resort situation as there is a relatively high chance of getting it wrong. 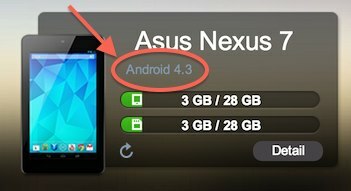 Android 3.x does exist, I just haven’t seem them in the wild. Cheap China tablets are typically several versions behind – you get what you pay for. You can find the Android release dates here: Android releases – but commercial product typically lag a few months behind. To give your old devices a second wind, visit the XDA-Developers forums – often newer Android versions can be found here for older devices. This method relies on the browser of your device, but not all browser work equally well (yes: I’m talking to you Amazon!). Most browsers provide information about the browser, Operating System, etc. which we can display. At Tweaking4All we offer exactly that. 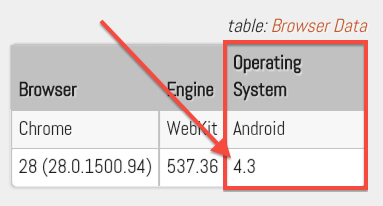 When you go to our Browser Information page, you will see a small table as shown below – with the arrow indicating the Operating System (Android) and Operating System Version (4.3). If you have an Android device and it does not show “Android” as the Operating System, then this trick does not work for your device – send a “Thank you” note to the manufacturer for adhering to standards and common practices. 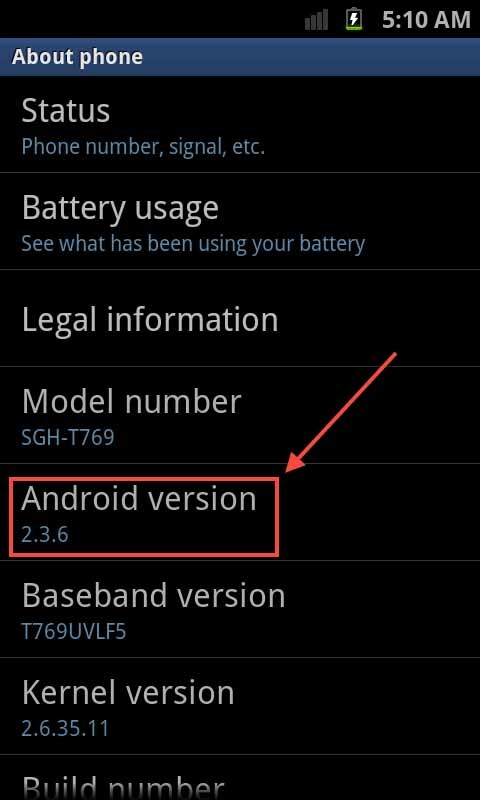 On almost every Android device, a version number can be found under the device settings. Unfortunately not all devices follow this practice, by not showing a version number matching the Android versioning (yes: I’m talking to you again Amazon!). A line will now possibly say “Android version” followed by a version number. The really screwed up thing is that I tried this on 5 Android devices and they literally all behaved differently. On a Kindle, this doesn’t even exist – the version number you might find there does not correlate with Android version numbers. There are a lot of so called “System Information” apps available and most of them are free and work as advertised. Kindle users: you’re limited to what the Amazon App Store and offers … and the selection is definitely not a good as Google Play. With some trickery Google Play can be made available on your Kindle device, but it will void your waranty. 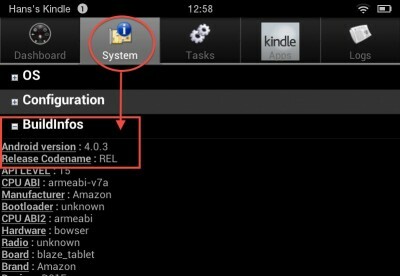 Android System Info for example, is available for free at Google Play and Amazon App Store and offers loads of info about your Android Phone or Tablet – it is available in the Amazon App Store, so it works on the Kindle devices as well. 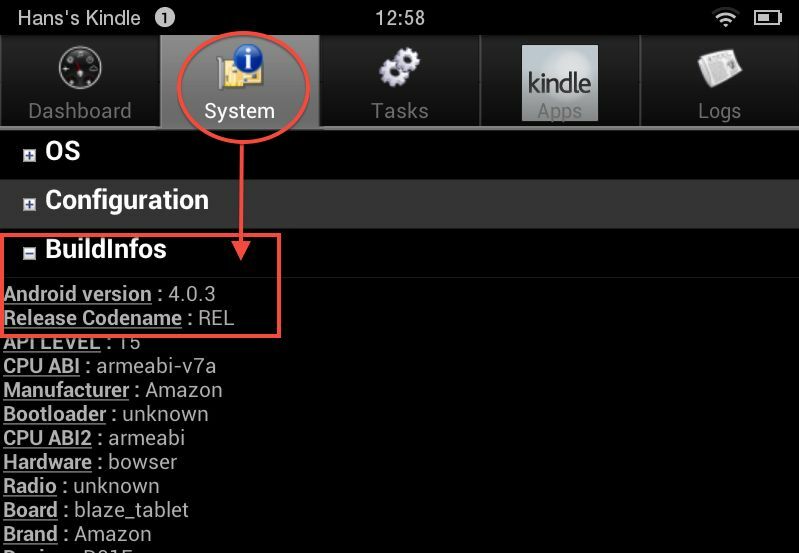 After installing, start the app, select the tab “System” and select the item “BuildInfos” line, and after unfolding, it will show a line “Android version” (4.0.3 in this example). Worth mentioning is AirDroid, a neat little tool to control your Android device through any web-browser (unfortunately not available at this time for the Kindle devices). When you install the (free) AirDroid and start it, a message will be displayed on your phone or tablet what address you have to type into your browser. Once the page opens in your browser you’ll see a slick desktop representation of your phone. In the upper right corner (in a default screen) you will see the brand, model and Android version of your Android device. Note : AirDroid also allows file transfer, although it can be relatively slow with larger files. Under the assumption that the manufacturer has this information available, after so called OTA updates (updates Over The Air – i.e. 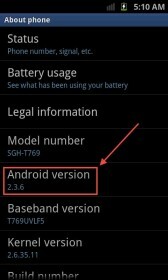 automatic updates) it might be difficult to predict what version of Android your device is running as it will probably not match the original Android version when you bought the device. For example the Kindle model specifications – short version: First generation Kindle runs Android 2.x, Android Fire and Fire HD models run Android 4.x. Other manufacturers might offer similar information. You must be getting pretty desperate to get to this option, but if nothing proved to work, then this could be your last resort. Basic screen differences that might give away a rough version indication as well can be seen in the illustration below. 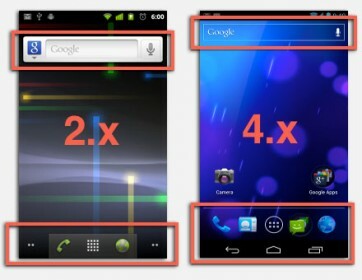 You will notice the clear difference between the Google Search-bar in Android 2.x (left) and Android 4.x (right). The 2.x version looks nice but feels “old”, where as the 4.x version looks much more modern and slicker. Also notice the differences in the buttons at the bottom – specially the 3 white buttons in Android 4.x.